WASHINGTON – Deanne Loonin, an advocate for low-income student loan borrowers and an attorney with the Harvard Law School Project on Predatory Student Lending, has a suggestion for the U.S. Congress in response to the federal student loan debt crisis. Policy experts discuss federal student loan defaults. “Discharge it” – all federal loans, not just those in default – in a comprehensive cancellation process “and start all over again” with a system that works better for students and the government, she said during an event Thursday at the American Enterprise Institute (AEI), where two research reports were unveiled that examined the national default crisis. Sequential panel discussions featuring policy experts delved into key findings of “Underwater on Student Debt: Understanding Consumer Credit and Student Loan Default” by Kristin Blagg of the Urban Institute and “Federal Student Loan Defaults: What Happens After Borrowers Default and Why” by Jason D. Delisle, Preston Cooper and Cody Christensen of AEI. Student loan debt has eclipsed credit card debt as the biggest form of debt among American citizens, and federal loans make up about 90 percent of student debt. The total amount of student loan debt has risen steadily for years, and now more than 8 million student borrowers are in default on their federal student loans – about one in every five borrowers whose loans have come due. Every quarter, according to the Urban Institute study, about 250,000 borrowers of federal direct loans default, with another 20,000 to 30,000 who had been in default and come out, defaulting again. Yet, as panel participants told nearly 50 guests, little is known about why borrowers default. More is known about who is likely to default: low-income students and students of color. Blagg’s study of federal student loan defaults – one of the first to use credit score data – added to the profile. Her research found a positive correlation between a student having other debt in collections, such as medical or utility bills, and likelihood that he or she will default on federal student loans. Income-based repayment options, she found, have not solved the problem. The average credit score of a defaulting students drops an average of 50 to 90 points in the year or two prior to the default, the report stated, but those who default usually have fair to poor credit scores even before they are supposed to enter repayment. · Investigate the effects of debt and collections obligations on student loan repayment because defaulting borrowers tend to be more financially distressed than nondefaulting borrowers by other collections debt. · Use credit scores to better target student loan repayment assistance, as a low credit score shouldn’t keep a student from getting a federal loan and credit score could be used as an impartial way to provide additional assistance for borrowers at a higher risk of default as they enter repayment. · Consider reshaping the way deferred, delinquent and defaulted loans increase a borrower’s total student loan balance because interest never stops accruing on the loans and can substantially increase the student’s debt. At the same time, revisit and consider modifications to interest and fee structures to encourage rather than discourage repayment. · Focus on discharge remedies that reach the highest-need borrowers, for example partial or full discharge for borrowers who spent several years in a social safety net program after leaving school. · Develop better measures of student loan acquisition and repayment, since analyzing data from only one cohort of borrowers ignores the multiple paths borrows can take in managing student loan debt. Noting various ways to cure a default, Delisle said borrowers should be made aware of all options and the process should be made fairer and simpler so that everyone is treated similarly regardless of which option they exercise. “It’s something the policy community needs to wrestle with,” he said. 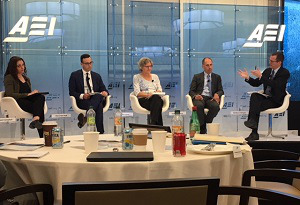 Noting that prior analyses have tended to focus on why borrowers default and how to prevent it, the AEI study explored what happens to students after they default and how data can inform policy reforms related to the collections process. Like the Urban Institute study, it raised more questions than it answered. “Overall, our findings suggest that the popular impressions of borrower outcomes after default, even among policymakers and researchers, are overly simplistic,” according to the report. “There is no one typical path borrowers follow after defaulting on a federal student loan. While some borrowers stay in default for years, others leave default quickly. Some borrowers see their balances rise throughout their time in default, while others pay down their loans in full. In a look at default exit rates from one year after default to five years out, the percentage of borrowers who never exited default went from 87 percent to 30 percent, the percentage who were no longer in default went from 11 percent to 62 percent, and the percentage who were back in default after previously exiting it want from 2 percent to 8 percent. Borrowers who exited default five years after entering it were most likely to be White, to have attended a two-year public school, and to have owed less than $5,000 at the time of default. “There’s still a lot we really don’t know” about why people default and what motivates them to reengage with the system later, said Alexander Holt, a policy analyst at the Pew Charitable Trust. Given the still limited data about borrowers who default on federal student loans, panelists agreed that more research – including longitudinal hard data and examination of loan counseling and servicing – is needed, as well as reform. Colleen Campbell, associate director for postsecondary education at the Center for American Progress, concurred with Loonin about discharge, suggesting a “targeted” way of doing it. She said it is “unfair to look at loans for everybody” and indicated that it is a matter of funding equity and “leveling the playing field” in terms of access. The costs of default are hard to quantify and go well beyond the dollars defaulters must repay, some noted. In conjunction with that, more research needs to be done on racial disparities in the system, said one attendee, Dr. Charles Burt. He is the student loan and foreclosure ombudsman in the banking bureau of the D.C. Department of Insurance, Securities and Banking. Noting that about 10 percent of D.C. residents owe more than $100,000 in student loans, he said such “crippling” debt impacts a person’s ability to save, maintain or buy a home, start or support a family and even work, as some states suspend or revoke the driver’s licenses and some professional licenses of individuals who default on federal student loans.